This general purpose pre-filter is designed to remove solid and liquid contaminants from compressed air. The filter will remove oil, water, condensate, dust, metal particles and pipescale. Solids will be removed down to 1 micron, liquids down to .5 mg/m3 W at 21 degrees C.
The filter utilizes the interception method for removing contaminants. The filter elements are long lasting and easily replaceable. The filter has an automatic float drain for constant removal of contaminants. This high efficiency filter is designed to remove liquids and solids from compressed air. The filter uses the coalescing method for removing contaminants. The filter elements are long lasting and easy to install. Lift and twist mechanism makes for easy element exchange. Removes particles down to 0.01 micron, liquids down to 0.01 mg/m3 W at 21 degrees C.
These filters should be preceded by a general purpose pre-filter. This high efficiency carbon filter is capable of removing oil vapor and odor from compressed air. The maximum remaining oil carryover is <0.003mg/m3 W at 21 degrees C. It is suitable for the food and drug processing industry as well as laboratories. The AC filter should be installed after the HE filter, which in turn should be preceded by a DP grade. The filter element is long lasting and easy to install. The element is constructed of a multi-layered activated carbon filter media, glass filled nylon end caps and a perforated stainless steel inner and outer support core. The lift and twist mechanism makes for easy element exchange. 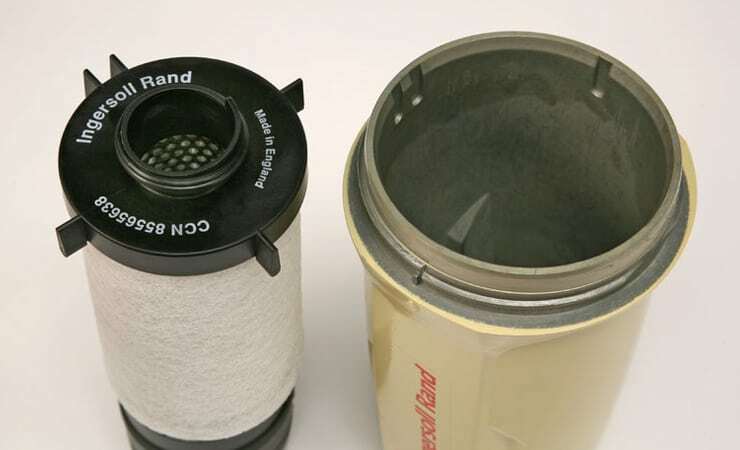 This dust filter removes particles 1 micron or greater from dried compressed air. The filter should be used for after-filter applications. The filter can be used for a wide range of applications such as removing dirt, metal particles and pipescale. The filter element is long lasting and easy to install or disassemble. The element is made up of multi-layered borosilicate microfibre filter media, glass filled nylon end caps and perforated stainless steel, inner and outer support cores. The filter includes a manual drainage system. It also includes a differential pressure indicator to monitor pressure drop.